As part of its Circular Economy programme, UKGBC has launched new guidance to assist developers and the supply chain in specifying and delivering buildings in line with circular economy principles. Roy Fishwick, Managing Director of ASBP patron member Cleveland Steel and Tubes, and a sponsor of the programme, spoke at a sell-out launch event on Thursday 4th April 2019 in London. ASBP board member Graham Hilton and ASBP technical & research associate Katherine Adams have contributed to the guidance via a technical working group. The guidance addresses the commercial realities associated with making this practically happen and provides support and evidence to assist clients in setting clear strategies that ensure budget, project timescales and risks are all minimised and mitigated. 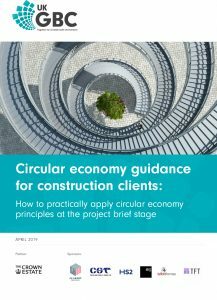 The guidance will also be helpful for those in the supply chain looking to support construction clients on their journey towards specifying and practically applying circular economy principles. In addition to the new guidance, our recent Re-usable Buildings – Climate-KIC Pathfinder Project is featured on a web based actor and resource map of circular economy initiatives and government policy within the built environment. For the project, ASBP has been working with lead partner London Waste and Recycling Board (LWARB) plus Forum for the Future, Sustainable Development Foundation and Whole Life Ltd to further develop and test the client benefits and business case for circular approaches to construction. The final report of the Climate-KIC funded project has now been published and can be downloaded here. To get involved with UKGBC’s Circular Economy programme, or to receive updates, please contact Anna.Surgenor@ukgbc.org.